West Africa is a very vulnerable part of the world to the impacts of climate change due to a combination of exposure and low adaptive capacity. Climate change has induced an increase in rainfall variability which in turn has affected the availability of water resources, ecosystem services and agricultural production. To adapt to the increased aridity, farmers have used indigenous and modern coping strategies such as soil and water conservation techniques, the use of drought‐ tolerant crops and varieties, crop diversification, etc., and lately, climate information services (CIS). CIS have positively contributed to suitable decision‐making in terms of farming, pastoral and fishing management systems. However, the scientific documentation of the engagement approaches, the uptake of the CIS and the ways the delivered information is being used, as well as feedback from the users, is lacking. Additionally, in most of the cases where CIS are introduced, the disconnect between the users and producers of the CIS seems to undercut large‐scale uptake. The objective of this paper* was to examine the approach used to involve stakeholders in the CIS uptake process in Senegal. It analyzes the experiences and lessons learnt in the country where various CIS products have been introduced using participatory methods (stakeholder consultations, interviews, field demonstrations, training workshops, etc.) and innovative stressors (SMS, voice messages, radios, mobile applications, etc.) to effectively involve producers, technicians and policy‐makers. This paper was originally published in the journal Climate on 19 February 2018. *Download the full paper from the right hand column. The methods used and key barriers, findings and lessons learned are provided in brief below - see the full text for much more detail. 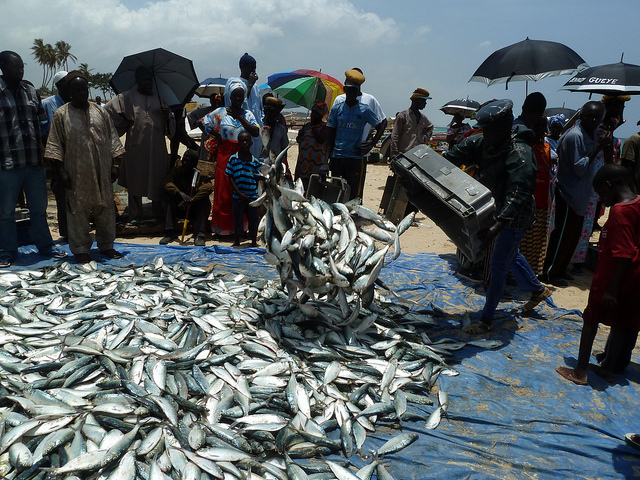 The study was conducted in 30 districts within 12 regions with high agricultural and pastoral potentialities and coastal regions with high artisanal fishery activities (Figure 1). The agricultural sector is characterized by poor soil and weather conditions, a lack of infrastructure and low access to quality seeds and fertilizer, and is unable to meet the food requirements of the 15 million people. Recent increases in extreme weather events (frequent high tides and swells, decreased visibility) have resulted in many fishermen reported dead or lost every year. These unfortunate cases have called for the introduction of climate information services in the fisheries sector to prevent the artisanal fishing communities from being affected by climate hazards while at sea. Figure 1: The study area (from page 3 of the paper). Needs assessment and end-user engagement for CIS development: A three‐day stakeholder consultation workshop in April 2016 gathered 75 people and facilitated interviews with 25 key actors. This consultation provided an opportunity for stakeholders to think about what climate information they need for their decision‐making. Participants were diverse and included lead farmers, pastoralists, fishermen, government ministry representatives, experts from the meteorological office and relevant non‐governmental organizations, and technicians from communication services (community radios, televisions, phone companies, etc.). Stimulating CS uptake: Three different tools were used to stimulate the engagement of the producers and the local authorities in the adoption of CIS: (1) the creation of 27 multi‐disciplinary working groups (MWGs); (2) 27 participatory training workshops with the producers; and (3) the implementation of a field demonstration with controlled CIS use by 62 lead‐farmers. Evaluation of CIS uptake among exposers: The evaluation of CIS use was done using three different methodological approaches: (1) interviews with selected farmers who had access to CIS; (2) evaluation workshops with the farmers; and (3) evaluation of the performance of the MWGs. Arable farming: The most important CIS are the seasonal forecast, the onset and cessation dates, the optimal sowing dates, daily rainfall forecasts, the false starts, the cumulative rainfall and the dry and wet‐spells. All CIS are needed at a much‐downscaled resolution. Livestock management: The three most important CIS are the fodder and water resource availability forecasts throughout the year and the potential lightning zones during the rainy season (to help avoid animal loss caused by the lightning). Fisheries: Six relevant CIS for the safety management of the sector are swell, tide and visibility forecasts, wind, lightning and sea surface temperature forecasts. All these CIS need to be produced and diffused daily for the different coastal areas. To date, 106 community radios promptly diffuse CIS to different communities. These play three distinct roles for CIS use: diffusing CIS received from the CIS forecasting center; collecting climate data through manual rain gauges provided by the CIS diffusion center; communicating rainfall data as well as CIS data to users. Leaders in the fisheries (about 962) and farmer (about 1829) communities directly receive CIS via SMS and voice call platforms. These leaders are mandated to share these CIS with their respective communities (resulting in an additional 5323 farmers reached). An email platform is used to send climate related information to 308 individuals, including government ministry officials, technicians of the public extension services and the community radios for a large diffusion to constituencies. Multi‐disciplinary working groups: 27 multi‐disciplinary working groups (MWGs) have been created in 27 districts out of the 30 studied. The performance evaluation revealed that in 2017, 21 MWGs have held on average six meetings. The most operational were those that had at least seven regular meetings. Farming sector: 27 trainings took place in 23 districts. 1439 people attended the trainings: 1124 were producers, 282 technicians and 32 media. An additional 5323 other people have been trained by the lead‐farmers who had the first and direct trainings. 16% of the beneficiaries of the trainings are women. Fisheries sector: Trainings targeted the leaders of the local artisanal fishers’ council (CLPA). Lead‐members from ten CLPAs in five different districts benefited from trainings on security at sea. 439 people attended the trainings (369 fishermen, 63 technicians and 12 journalists), among which only 4% were female. During the different trainings (farmers and fishermen), the phone numbers of the participants and their relevant profile information were recorded to supply the database of the SMS and voice call platforms. Out of 289 surveyed people, 78% of the respondents have used the diffused CIS to guide their decision‐making at the beginning of the rainy season. The decisions taken are related to the choice of croplands, crop varieties, sowing, ploughing and fertilizer spreading dates. The results also indicated that 94% of the respondents have shared the information or knowledge they have gained during the training with their parents, friends and members of their organizations, of which 11% are women. The funding sources for CIS delivery: From the production to the diffusion through the training of the users to understand and strongly use the CIS, there is a huge cost associated that goes beyond the financial capacity of a national meteorological office. During the evaluations, the CIS end‐users have mentioned the fact that the trainings did not happen at time suitable for them to gain the full benefit of it. The number of technicians being very limited, some trainings were delivered at periods during which the farmers had started their farming activities. In addition, some CIS were diffused with delay or at a time when it was difficult for the users to take appropriate actions. Preferably, the users request the CIS to be diffused two to three days before the actual occurrence of the event. Despite the efforts made to produce the relevant CIS for the livestock sector, none has been produced. This is due to the complexity of these CIS, which require competences from multiple backgrounds. Although the engagement of the authorities is effective at the district level, this is not yet the case for the policy makers at the national level. For any new technology to be successfully introduced in rural communities, a bottom‐up approach combined with policy‐maker involvement at local, regional and national levels is required. The use of participatory methods and the inclusion of indigenous knowledge from the identification of the relevant CIS and communication channels to the training of the users to understand and effectively use the CIS for their production practices has built a mutual trust between the CIS users and providers and enabled the widespread adoption of the technology. This has also enabled the strong engagement of the local, regional and national authorities, thus creating a political enabling environment for the sustainability of the use of CIS. Some challenges do exist and are concerned with the lack of permanent funding sources, the production of downscaled and missing CIS and the timely delivery of CIS and relevant training on the ground. advocating for a large subscription of the producers to the insurance system so that the costs of CIS production and diffusion/trainings could be incorporated into the primes the producers will pay for.